Welcome to the future of food: A mother looking for a heathier snack for kids builds an all-natural popsicle empire; a recent graduate sitting in a rideshare envisions the access economy tailored to culinary start-ups; a pharmaceutical executive takes a chance on the fermented tea brewing in her closet. Instead of trying to revamp the food system from the top down, entrepreneurs are building innovative solutions from the ground up. Smart ideas are bubbling up everywhere, as Danielle Nierenberg, N01, learned in her work with an environmental organization before founding the think tank Food Tank. “I was seeing on-the-ground innovative solutions—in kitchens, in board rooms, in town halls, in fields—that could be scaled up and out,” she said. 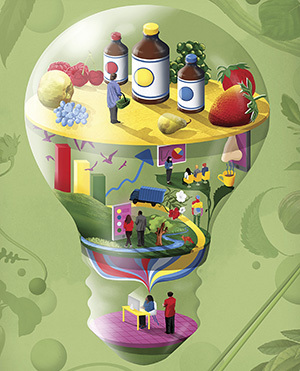 Why the boom in food innovation now? “The interest in food is high because we’ve collectively backed ourselves into a food-supply corner that values high-volume and low-cost over nutrition,” said Rachel Cheatham, N05, NG08, whose company Foodscape helps businesses develop healthier products. With a growing awareness that our environment and our health are suffering the consequences, we need to make a change. Food entrepreneurship is about making it. That means opportunity aplenty for passionate graduates with food-related degrees, and for professionals longing to reorient their skillsets.